Im a blogger Dottie...a rebel: The Mystery of Walt's Desk. The Mystery of Walt's Desk. Remember this picture from my last post? I have been to One Man's Dream hundreds of times and there was always something that bothered me about this desk. 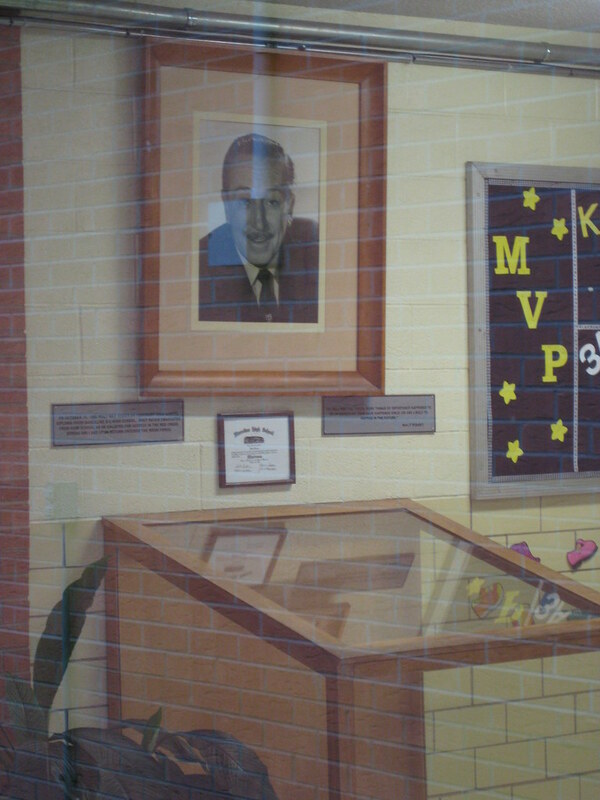 You cannot see it in the above photo but there is a picture of Walt with his desk pointing at his handy work. What's strange about this is that the desk on display while it does have the W.D. carved into it is not in the same place. There are also markings on the desk in Walt's photo that do not appear on the display desk. 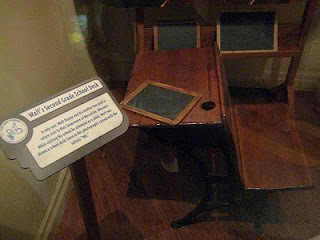 So you can imagine my surprise when I when I walk into Walt Disney's Home Town Museum in Marceline Missouri and see Walt Disney's second grade desk on display! How is Walt's desk in two places at once? The answer is simple, the Florida desk is an impostor. It makes me wonder what else in One Man's Dream is a fake. Unfortunately photography is not allowed in the Home Town Museum so I could not document this Pulitzer prize worthy story. So you'll just have to take my word for it. Or you can make a trip to Marceline and see the actual desk for yourself! I have also heard that they cannot confirm that it is Walt's desk. Hmmmm. Interesting! I did a post in December about the actual bench that Walt sat on in Griffith Park while dreaming about building Disneyland (it's now in the Opera House on Main St.) I wondered the same thing....how do they know that was the EXACT same bench? Now if Walt went up there and aquired the bench himself years ago, then maybe I'd believe the story, But they don't tell you how long that bench has been in the company's possesion or how it was aquried, so now your story has caused me to have some doubt.